The Kemptown Carnival is set for a spectacular return on June 1st 2019! But, as Brighton’s largest free community arts street festival, we are asking for your support to ensure the Kemptown Carnival can continue to take place year on year. Please help to make the Kemptown Carnival happen this year and for years to come by supporting our crowd funder today! All the money raised via our crowd funder will help to fund the stages, artists, staff and vital core infrastructure at this year’s Carnival and to ensure Kemptown Carnival can continue running in the future. Join in the parade! By buying a Parade Participation Pack, you, your family and friends can get involved in the Carnival itself this year and join in with the community parade! The pack provides spaces for up to 4 people to join the community bloco alongside many of Brighton’s samba community bands, mobile sound systems and other processional performance groups. There are many other rewards on offer when you support our crowdfunder…from carnival postcards and t-shirts, to poster art and a digital album of some of Brighton's most talented band and musicians. 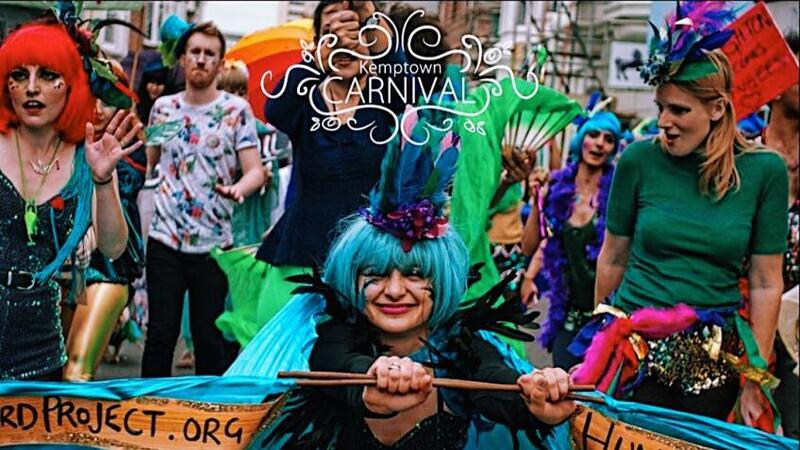 The Kemptown Carnival is one of Brighton’s most cherished free community arts street festivals and takes place across Kemptown Village. It is jammed pack with entertainment and activities for all ages and includes a diverse live music program across nine stages, a host of community performances, a vibrant street market, street theatre, great local food and drink, children's entertainment and creative workshops, fairground rides and a community parade to launch the day. Rewards that are available as a thank you for supporting our crowdfunder are listed to the right. We can't wait to see you on Saturday June 1st! Entry for you and up to another 3 people entry into our parade Community Bloco! Dance and prance along with a samba band through the heart of Kemptown in your most colourful attire. Plus receive a participation pack full of costume ideas, hints and tips! A selection of beautiful local images by Brighton photographers capturing the spirit of Kemptown Carnival. Full digital download of Brighton's leading bands including: Carnival Collective, Resonators, Derriere, Swing Ninjas, Dende, Mountain Firework Company, and more. A high quality print of exclusive artwork produced for the Carnival by local Brighton artist Judi Thomas. A colourful Kemptown Carnival t-shirt for you to enjoy Carnival vibes all year round! Plus a set of postcards. A set of postcards, Carnival t-shirt, exclusive artwork print and digital download! Ensuring you're set for the summer, Carnival style. Get Carnival ready and kitted out in the finest attire by Gladrags Community Costume store. A group of up to four will have the opportunity to choose their Carnival costumes from the awesome Aladdin's Cave that is Gladrags; think feathers, sequins, silks and headdresses! And of course, entry into the parade for all.